The greatest tennis match in history at Wimbledon in July, an epic five-set, four-hour battle was a treat to watch. It definitely achieved one thing for the sport. Generating the right buzz and interest for tennis. 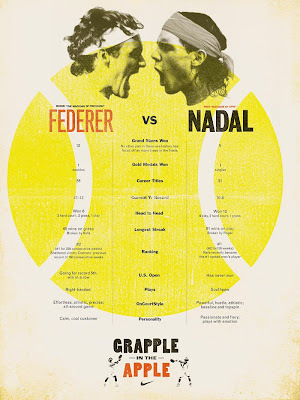 Now, a new campaign by Nike portrays Nadal and Federer as boxing rivals to capitalize on the attention this rivalry has recently brought to the sport by touting a potential finals showdown between the two at the U.S. Open as a heavyweight prize fight. The players have even been given boxer-type nicknames: Roger "The Magician of Precision" Federer and Rafa "Matador of Spin" Nadal. Tennis will never be the same.